Citation Information: J Clin Invest. 2006;116(1):202-208. https://doi.org/10.1172/JCI26210. Peripheral neuropathy in Spg7–/– mice. (A–D) Semithin sections of the distal sciatic nerve of a 6-month-old WT mouse (A) and Spg7–/– mice at 6 months (B), 10 months (C), and 18 months (D) of age. 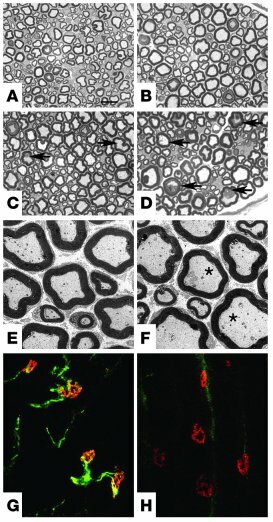 Axonal changes, characterized by the accumulation of dense material (arrows), are appreciated in Spg7–/– mice at 10 months and increase in severity at 18 months. (E and F) Electron micrographs of the sciatic nerve of 6-month-old WT (E) and Spg7–/– (F) mice. A few axons already contain abnormal mitochondria in Spg7–/– mice (asterisks). (G and H) Confocal images of neuromuscular junctions from teased muscular fibers of 24-month-old WT (G) and Spg7–/– (H) mice double-labeled with rhodamine-tagged α-bungarotoxin to stain acetylcholine receptors (red) and antibody to neurofilament NF200 to detect axons (green). Control preparations reveal the typical (1 axon per end plate) pattern of innervation, while in mutant mice the terminal plates are denervated. Scale bar: 15 μm (A–D); 5 μm (E and F). Magnification, ×63 (G and H).